The early sequence model of emphasized the accumulation of ﬂuvial deposits during the late highstand phase of the sea-level cycle. The model suggested that the longitudinal proﬁle of rivers that are graded to sea level would shift seaward during a fall in base level, and that this would generate accommodation for the accumulation of nonmarine sediments. This idea was examined critically and was described scenarios where this may and may not occur. The response of ﬂuvial systems to changes in base level was examined from a geomorphic perspective in greater detail, and the sequence stratigraphy of nonmarine deposits was critically reviewed. In general, the importance of base-level change diminishes upstream. In large rivers, such as the Mississippi, the evidence from the Quaternary record indicates that sea-level changes affect aggradation and degradation as far upstream as the region of Natchez, Mississippi, about 220 km upstream from the present mouth. Farther upstream than this, source-area effects, including changes in discharge and sediment supply, resulting from tectonism and climate change, are much more important. In the Colorado River of Texas base-level inﬂuence extends about 90 km upstream, beyond which the river has been affected primarily by the climate changes of Neogene glaciations. At some point upstream rivers become completely independent of higher order relative changes in base level, and are responding to a tectonically controlled long-term average base level of erosion. The response of river systems to climate change is complex. Cycles of aggradation and degradation in inland areas may be driven by changes in discharge and sediment load, which are in part climate dependent. These cycles may be completely out of phase with those driven primarily by base-level change. The sequence boundary is commonly an incised valley eroded during the falling stage of the base-level cycle. This valley is ﬁlled with ﬂuvial or estuarine deposits during the lowstand to transgressive part of the cycle, with the thickness and facies composition of these beds determined by the balance between the rates of subsidence, base-level change and sediment supply. Away from the incised valley, on interﬂuve areas, the sequence boundary may be marked by well-developed paleosol horizons. It is a matter of debate whether the ﬂuvial ﬁll of an incised valley should be assigned to the lowstand or the transgressive systems tract. The shape of the sea-level curve and the timing of these deposits relative to this curve are usually not knowable, and so this is a somewhat hypothetical argument. Transgression is commonly indicated by the appearance of abundant tidal inﬂuence in the ﬂuvial succession. Sigmoidal cross bedding, tidal bedding (wavy, ﬂaser and lenticular bedding), oyster beds and brackish to marine trace fossils are all typical indicators of tidal-marine environments. The transition from ﬂuvial to tidal is typically diachronous, and the ﬁlling of the incised valley changes from aggradational to retrogradational. Inland from tidal inﬂuence, the change from the lowstand to the transgressive phase may be marked by a change in ﬂuvial style or by the development of coal beds. Coal commonly occurs during an initial increase in accommodation, before this is balanced by an increase in clastic supply. 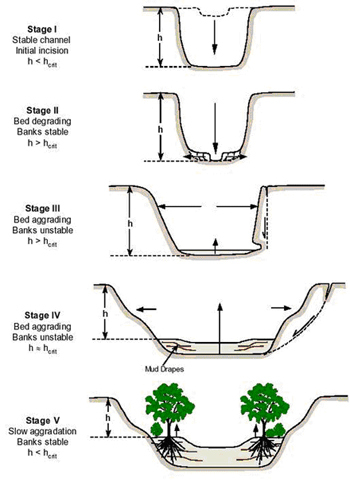 Within the valleys of major rivers, the increase in accommodation can result in more loose stacking of channel sand bodies and greater preservation of overbank ﬁnes. 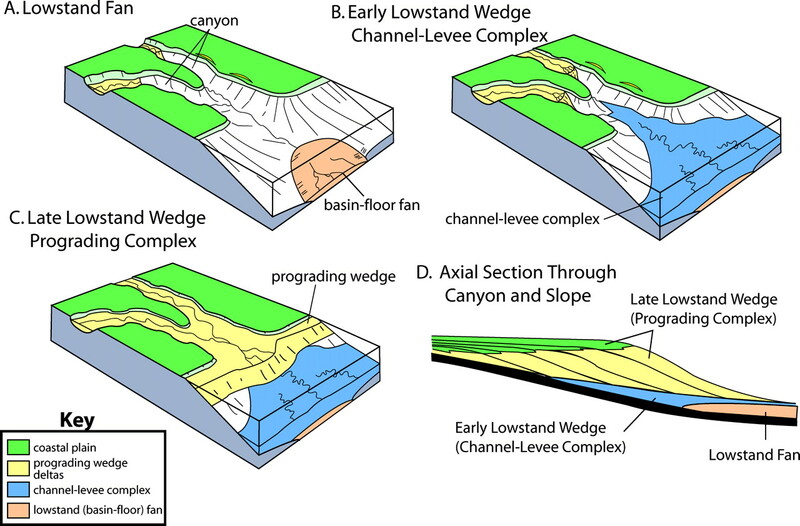 Changes in ﬂuvial style are also common, with braided rivers typifying lowstand systems and anastomosed or meandering rivers common during times of high rate of generation of accommodation, as during the transgressive phase of the base-level cycle. A highstand systems tract develops when base-level rise slows, and the rate of generation of accommodation space decreases to a minimum. There are two possible depositional scenarios for this phase of sequence development. Retrogradation of the river systems during transgression will have led to reduced slopes, and a low-energy landscape undergoing slow accumulation of ﬂoodplain deposits, limited channel aggradation, and closely-spaced, well-developed soil proﬁles. Given no change in source-area conditions, however, the sediment supply into the basin will continue, and vigorous channel systems will eventually be re-established. Under these conditions, channel bodies will form that show reduced vertical separation relative to the TST, leading to lateral amalgamation of sandstone units and high net-to-gross sandstone ratios. 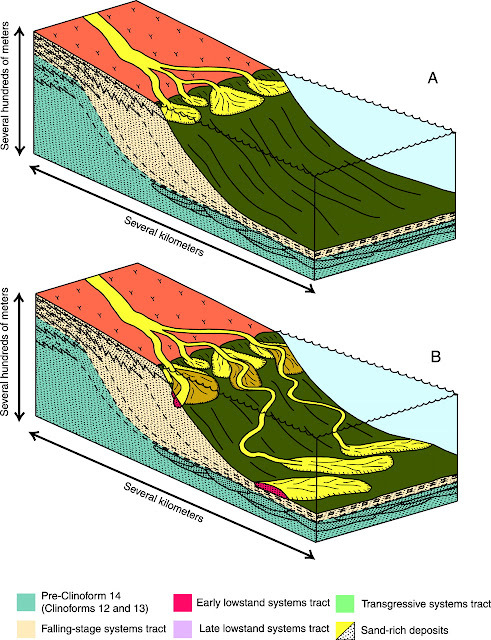 Basinward progradation of coastal depositional systems leads to downlap of deltaic and barrier-strandplain deposits onto the maximum ﬂooding surface. It seems likely that the HST will be poorly represented in most nonmarine basins, because the highstand is usually followed by the next cycle of falling base level, which may result in the removal by subaerial erosion of much or all of the just-formed HST deposits. A minor increase in the sand-shale ratio immediately below the sequence boundary may be the only indication of the highstand phase, as in the Castlegate Sandstone of Utah. Care must be taken to evaluate all the evidence in interpreting such data as net-to-gross sandstone ratios. Changes in this parameter may not always be attributable to changes in the rate of generation of accommodation space. An increase in the proportion of channel sandstones in a section seems to have been related not to changes in the rate of generation of accommodation space, but to increased sediment runoff resulting from increased rainfall. In the case of sequences driven by orbital forcing mechanisms, where both base-level change and climate change may be involved, unravelling the complexity of causes and effects is likely to be a continuing challenge. Rising base level is the main control on the rate and style of channel stacking, the rate of generation of accommodation is small during transgression in inland areas while the coastline is still distant, and increases only once transgression has brought the coastline farther inland where the effect of baselevel rise on the lower reaches of the river produces a more rapid increase in accommodation. The rate of generation of accommodation is greater during the highstand than during transgression, and results in low net-to-gross sandstone ratios. However, this line of reasoning omits the inﬂuence of upstream factors, and must therefore not be followed dogmatically. One must also be cautious in using systems-tract terminology derived from marine processes for the labeling of nonmarine events. There may be a considerable lag in the transmission of a transgression upstream to inland positions by the process of slope reduction, aggradation and tidal invasion. The inland reaches of the river will not “know” that a transgression is occurring, and it is questionable, therefore, whether the deposits formed inland during the initial stages of the marine transgression should be included with the TST. An alternative terminology for the standard systems tract terms used for marine basins because, obviously, terms that include such words as transgressive, highstand, etc., are inappropriate for basins that are entirely nonmarine. For falling stage and lowstand deposits the term degradational systems tract, for transgressive deposits, transitional systems tract, and for highstand deposits, aggradational systems tract. These terms provide analogous ideas regarding changes in accommodation and sediment supply and their consequences for depositional style. In marine basins this will be marine base level (sea level). 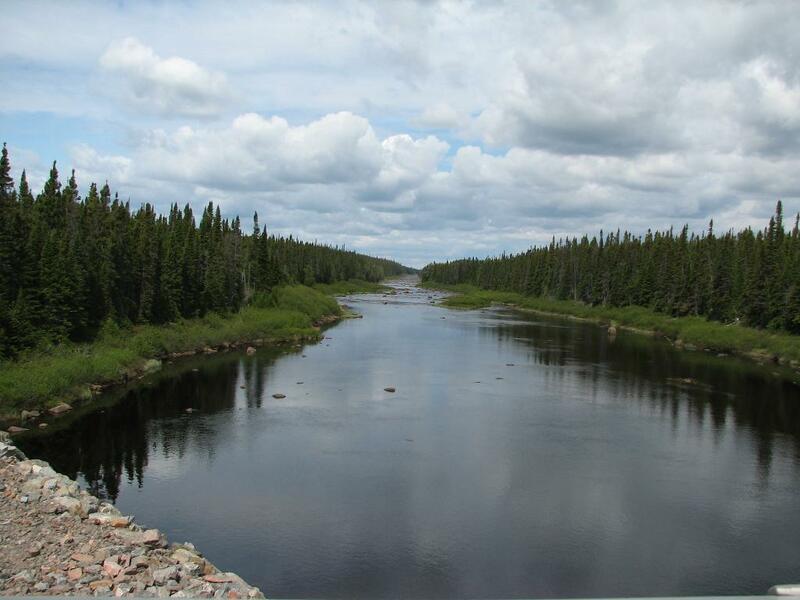 In inland basins it will be the lip or edge of a basin through which the trunk river ﬂows out of the basin. The buffer is the zone of space above and below the current graded proﬁle which represents the range of reactions that the proﬁle may exhibit given changes in upstream controls, such as tectonism or climate change, that govern the discharge and sediment load of the river. 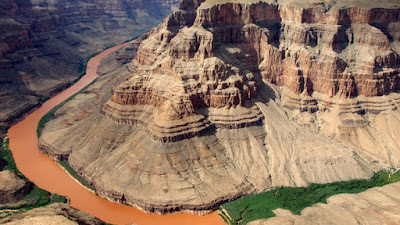 For example, tectonic uplift may increase the sediment load, causing the river to aggrade towards its upper buffer limit. A drop in the buttress, for example as a result of a fall in sea level, may result in incision of the river system, but if the continental shelf newly exposed by the fall in sea level has a similar slope to that of the river proﬁle, there may be little change in the ﬂuvial style of the river. In any of these cases, the response of the river system is to erode or aggrade towards a new dynamically maintained equilibrium proﬁle that balances out the water and sediment ﬂux and the rate of change in accommodation. The zone between the upper and lower limits is the buffer zone, and represents the available (potential) preservation space for the ﬂuvial system. Nowhere within coastal ﬂuvial systems is there a single erosion surface that can be related to lowstand erosion. Such surfaces are continually modiﬁed by channel scour, even during transgression, because episodes of channel incision may reﬂect climatically controlled times of low sediment load, which are not synchronous with changes in base level. This is particularly evident landward of the limit of base-level inﬂuence. 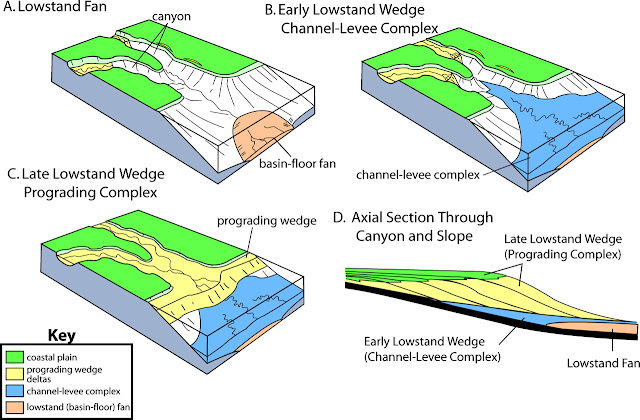 Post-glacial terraces within inland river valleys reveal a history of alternating aggradation and channel incision reﬂecting climate changes, all of which occurred during the last post-glacial rise in sea level. A major episode of valley incision occurred in Texas not during the time of glacioeustatic sea-level lowstand, but at the beginning of the postglacial sea-level rise, which commenced at about 15 ka. The implications of this have yet to be resolved for inland basins where aggradation occurs (because of tectonic subsidence), rather than incision and terrace formation. However, it would seem to suggest that no simple relationship between major bounding surfaces and base level change should be expected. Fluvial processes in relationship to glacially controlled changes in climate and vegetation, based on Dutch work. These studies, and those in Texas, deal with periglacial regions, where climate change was pronounced, but the areas were not directly affected by glaciation. A major period of incision occurred during the transition from cold to warm phases because run off increased while sediment yield remained low. Vegetation was quickly able to stabilize river banks, reducing sediment delivery, while evapotranspiration remained low, so that the run off was high. Fluvial styles in aggrading valleys tend to change from braided during glacial phases to meandering during interglacials. 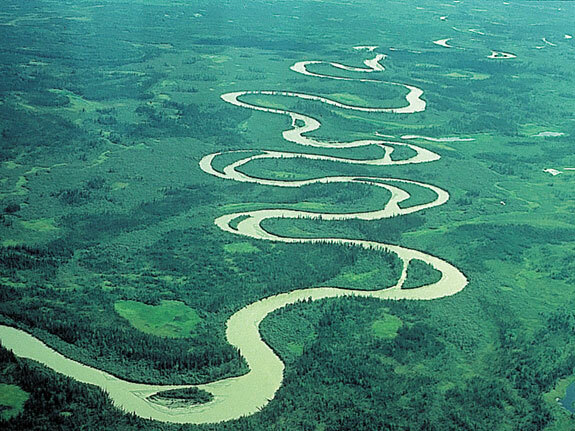 With increasing warmth, and consequently increasing vegetation density, rivers of anastomosed or meandering style tend to develop, the former particularly in coastal areas where the rate of generation of new accommodation space is high during the period of rapidly rising base level. Valley incision tends to occur during the transition from warm to cold phases. Reduced evapotranspiration consequent upon the cooling temperatures occurs while the vegetation cover is still substantial. Therefore run off increases, while sediment yield remains low. With reduction in vegetation cover as the cold phase becomes established, sediment deliveries increase, and ﬂuvial aggradation is reestablished. It is apparent that ﬂuvial processes inland and those along the coast may be completely out of phase during the climatic and base-level changes accompanying glacial to interglacial cycles. Within a few tens of kilometres of the sea, valley incision occurs at times of base level lowstand, during cold phases, but the surface may be modiﬁed and deepened during the subsequent transgression until it is ﬁnally buried. Inland, major erosional bounding surfaces correlate to times of climatic transition, from cold to warm and from warm to cold, that is to say during times of rising and falling sea level, respectively. The Dakota Group of north-east New Mexico and southeast Colorado provides a good example of an internally architecturally complex ﬂuvial unit generated by a combination of upstream tectonic controls and downstream sea-level cycles. At the coastline, progradation and retrogradation creating three sequences were caused by sea-level cycles on a 105-year time scale. Each of these sequences can be traced up dip towards the west,where they are composed of repeated cycles of aggradational valley-ﬁll successions and mutually incised scour surfaces. These cycles reﬂect autogenic channel shifting within the limited preservation space available under conditions of modest, tectonically-generated accommodation. This space is deﬁned by a lower buffer set by maximum local channel scour, and an upper buffer set by the ability of the river to aggrade under the prevailing conditions of discharge and sediment load. The highstand systems tract (HST) corresponds to a period when little new accommodation is being added to the depositional environment. Base-level rise is in the process of slowing down as it reaches its highest point, immediately prior to commencement of a slow fall. If the sediment supply remains more or less constant, then Rd>Rs at this point. 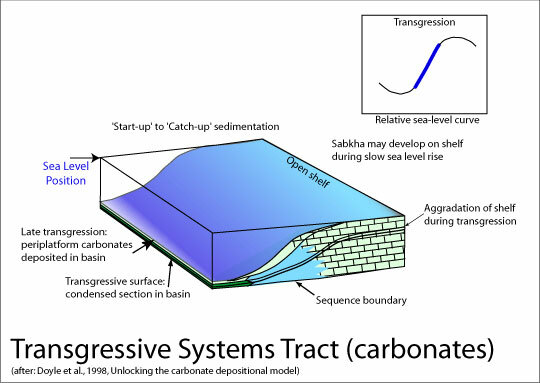 The most characteristic feature of this systems tract is the lateral progradation of coastal sedimentary environments. Major coastal barrier-lagoon and deltaic complexes are the result. Normal regression is the term used to describe the seaward advance of the coastline as a result of the progressive addition of sediment to the front of the beach or the delta systems, developing a broad topset environment. This is in contrast to the condition of forced regression, which is described below. 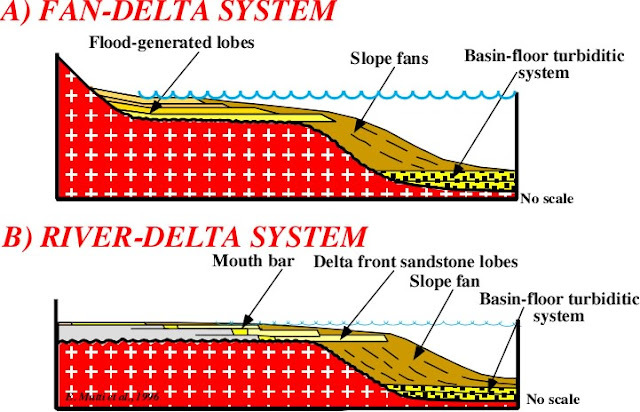 Where the terrigenous sediment supply is high, delta systems may largely dominate the resulting sedimentary succession, as shown in the accompanying example of the Dunvegan delta. The allomember boundaries in this diagram indicate times of relative low sea level, followed by ﬂooding. Each allomember boundary is overlain by a mudstone representing the maximum ﬂooding surface, over which delta complexes prograded. Sedimentary environments characteristically include coastal mangrove swamps, and may include signiﬁcant peat swamps, the sites of future coal development. The numbered subdivisions of each allomember indicate individual deltaic shingles. Subsurface mapping may indicate that shingles of this type shifted laterally as a result of delta switching, in a manner similar to the Mississippi delta and the Yellow River delta. This points to potential confusion in terminology, because upward-shoaling successions. The thickness of highstand shelf deposits depends on the accommodation generated by marine transgression across the shelf, typically a few tens of metres, up to a maximum of about 200 m. Where the shelf is narrow or thesediment supply is large, deltas may prograde to the shelf-slope break, at which point deltaic sedimentation may extend down slope into the deep basin. High-amplitude clinoforms may result, including signiﬁcant volumes of sediment-gravity-ﬂow deposits. The falling-stage systems tract (FSST). A fall in base level from the highstand position exposes the coastal plain and then the continental shelf, to subaerial erosion. River mouths retreat seaward, and under most conditions, river valleys incise themselves as they continually grade downward to progressively lower sea levels. Deeply incised paleovalleys may result. In the rock record, many of these show evidence of multiple erosional events, indicating repeated responses to autogenic threshold triggers or perhaps to minor cycles of base level change. Signiﬁcant volumes of sediment are eroded from the coastal plain and the shelf, and are fed through the coastal ﬂuvial systems and onto the shelf.Eventually, these large sediment volumes may be tipped directly over the edge of the shelf onto the continental slope, triggering submarine landslides, debris ﬂows, and turbidity currents. These have a powerful erosive effect, and may initiate development of submarine erosional valleys at the mouths of the major rivers or off shore from major delta distributaries. Many submarine canyons are initiated by this process, and remain as major routes for sediment dispersal through successive cycles of base-level change. The FSST is typically the major period of growth of submarine fans. The falling base level causes basinward retreat of the shoreline, a process termed forced regression. The occurrence of forced regression, as distinct from normal regression, may be detected by careful mapping of coastal shoreline sandstone complexes. Fall of sea level causes water depths over the shelf to decrease, increasing the erosive power of waves and tides. This typically leads to the development of a surface called the regressive surface of marine erosion (RSME), which truncates shelf and distal coastal (e.g., deltaic) deposits that had been formed during the preceding highstand phase. The ﬁrst such surface to form, at the commencement of a phase of sea-level fall, is termed the basal surface of forced regression.. Given an adequate sediment supply, especially if there are pauses during the fall of sea level, shoreface sand accumulates above the RSME, forming what have come to be informally termed sharp-based sandstone bodies. These are internally identical to other coastal, regressive sandstone bodies, except that they rest on an erosion surface instead of grading up from the ﬁne-grained shelf sediments, as in the initial coastal sands (which are the product of normal regression). Repeated pulses of sea-level fall punctuated by still stand may develop several off lapping surfaces of marine erosion. Shelf-margin deltas may form where the mouths of major river systems regress to the shelf-slope break during forced regression. The falling-stage is typically the interval during the sea-level cycle when the sediment supply to the continental shelf and slope is at its greatest. Most sediment accumulation on submarine fans occurs during this and the next phase, the lowstand. Most of the early sequence models showed submarine fans resting on a basal sequence boundary, but this conﬁguration now seems unlikely. On the continental shelf and coastal plain, the sequence boundary is an erosion surface representing the lowest point to which erosion cuts during the falling stage of the base-level cycle. As sea-level fall slows to its lowest point, sediment delivery from the newly exposed coastal plain and shelf will gradually diminish. Sedimentation on submarine fans will correspondingly slow down, and the deposits may show a gradual upward decrease in average grain size. Sedimentation there may virtually cease once the next phase of sea-level rise commences, and the rivers feeding sediment to the slope become ﬂooded (transgressive systems tract). The sequence boundary, therefore, is likely to be contemporaneous with the middle to upper part of the submarine-fan succession, possibly with the top of it. However, there is unlikely to be an actual mappable break in sedimentation at this level, and it may be difﬁcult to impossible to locate the position in the section corresponding to the turnaround from falling to rising sea level. This horizon is therefore called a correlative conformity, although his original application of the term was to the ﬁne-grained sediments formed in deep water beyond the submarine-fan wedge, out in the deep basin where it was assumed sedimentation would be continuous throughout a sea-level cycle. The sequence boundary (SB) marks the lowest point reached by erosion during the falling stage of the sea level cycle. On land this is represented by a subaerial erosion surface, which may extend far onto the continental shelf, depending on how far sea level falls. The sequence boundary cuts into the deposits of the highstand systems tract and is overlain by the deposits of the lowstand or transgressive systems tracts. It is therefore typically a surface where a marked facies change takes place, usually from a relatively lowerenergy deposit below to a high-energy deposit above. Mapping of such a surface in outcrop or in the subsurface, using well logs, is facilitated by this facies change, except where the boundary juxtaposes ﬂuvial on ﬂuvial facies. In such cases, distinguishing the sequence boundary from other large-scale channel scours may be a difﬁcult undertaking. This systems tract represents the interval of time when sea-level has bottomed out, and depositional trends undergo a shift from seaward-directed (e.g., progradational) to landward-directed (e.g.,retrogradational). Within most depositional systems there is little that may be conﬁdently assigned to the lowstand systems tract. The initial basal ﬁll of incised river valleys, and some of the ﬁll of submarine canyons are deposited during this phase. Volumetrically they are usually of minor importance, but they may be of a coarser grain size than succeeding transgressive deposits. In parts of the incised valley of the Mississippi River, for example (the valley formed during Pleistocene glacioeustatic sea-level lowstands), the basal ﬁll formed during the initial post-glacial transgression is a coarse braided stream deposit, in contrast to the sandy meandering river deposits that form the bulk of the Mississippi river sediments. The episode of active submarine-fan sedimentation on the continental slope and deep basin may persist through the lowstand phase. There may be a phase of normal regressive sedimentation at the lowstand coastline. On coastal plains, the lowstand is a time of still stand, when little erosion or sedimentation takes place. Between the major rivers, on the inter ﬂuve uplands, this may therefore be a place where long-established plant growth and soil development takes place. Peat is unlikely to accumulate because of the lack of accommodation, but soils, corresponding in time to the sequence boundary, may be extensive, and the resulting paleosols may therefore be employed for mapping purposes. A rise in base level is typically accompanied by ﬂooding of incised valleys and transgression across the continental shelf. Base-level rise exceeds sediment supply, leading to retrogradation of depositional systems (Rd<Rs), except that at the mouths of the largest rivers sediment supply may be sufﬁciently large that deltas may continue to aggrade or prograde. Flooded river valleys are estuaries; they typically provide ample accommodation for sedimentary accumulation. In estuarine successions, the upward transition from lowstand to transgressive systems tract in estuaries and other coastal river systems is commonly marked by the development of wave- or tide inﬂuenced ﬂuvial facies, such as tidal sand bars containing sigmoidal crossbedding or ﬂaser bedding. The sedimentology of this environment has received much attention, because of the potential for the development of stratigraphic sandstone traps, in the form of valley-ﬁll ribbon sands. Studies of ancient paleovalley ﬁlls have shown that many are complex, indicating repeated cycles of base level change and/or autogenic changes in sediment dispersal. On the continental shelf the most distinctive feature of most transgressive systems tracts is the development of a widespread transgressive surface (TS),a ﬂooding surface covered with an equally widespread marine mudstone. A transgressive conglomeratic or sandy lag may blanket the ﬂooding surface. Offshore, rapid transgression may cut the deep-water environment off from its sediment source, leading to slow sedimentation, and the formation of a condensed section. This is commonly a distinctive facies, consisting of concentrated shell or ﬁsh fragments, amalgamated biozones, and a “hot” (high gamma-ray) response on well-logs, reﬂecting a concentration of radioactive clays. Signiﬁcant volumes of clastic sediment deposited on the shelf may be reworked during transgression. Numerous complexes of shelf sand ridges constituting parts of shelf transgressive systems tracts that were formed by vigorous wave and tide action. 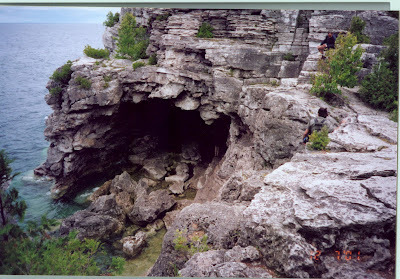 Offshore, limestones may be deposited, such as the several Jurassic and Cretaceous limestones and chalks in the Western Interior Seaway (Greenhorn Limestone, Austin Chalk). In the nearshore setting, wave erosion during transgression is usually the cause of ravinement, with the development of a diachronous ravinement surface. The juxtaposition of marine shelf sediments, above, over coastal shoreline or lagoonal sediments below, creates a prominent surface which should not be confused with a sequence boundary. A ravinement surface marks an upward deepening, the opposite of the facies relationships at most sequence boundaries. In some cases, ravinement erosion may cut down through lowstand deposits and into the underlying highstand systems tract, and in such cases the ravinement surface becomes the sequence boundary. Peat may be deposited on the coastal plain and in deltaic settings at any time during a cycle of base-level change. However, the thickest and most widespread coals are now known to be those formed from peat accumulated during transgression, because of the accommodation provided by rising base level, during a time when clastic inﬂux into the coastal plain is “held back” by the landward-advancing shoreline. The maximum ﬂooding surface (MFS) marks the end of the phase during which the difference between the rate of sea-level rise and the rate of sediment supply is at its greatest. Sea-level rise continues beyond this point, but as the rate of rise slows, sediment input begins to re-establish progradation at the shoreline, and this deﬁnes the transition into the highstand systems tract. The offshore shale formed around the time of the MFS is an excellent mapping marker, because of its widespread nature and distinctive facies. In areas distant from the shoreline, where clastic sediment supply is at a minimum, the MFS is commonly marked by calcareous shale, marl or limestone. In some studies, sequence mapping is accomplished using this surface in preference to the sequence boundary, because of its more predictable facies and its consistent horizontality. The preceding paragraphs constitute a set of useful generalizations. However, there are many exceptions and special cases. For example, consider the ultimate fate of the clastic sediment ﬂux on continental margins during cycles of sea level change. In the traditional model on which this section is largely based, coastal plain complexes, including deltas, typically accumulate during highstand phases, following a period of coastal plain transgression and ﬂooding, and basin slope and plain deposits, including submarine fans, accumulate during the sea-level falling stage and lowstand. However, these generalizations do not necessarily apply to all continental margins. The development of submarine fans on the California border land at times of sea-level high stand. The connection of canyon and fan dispersal systems to the littoral sediment supply is the key control on the timing of deposition in this setting. In addition to the physiographic variations noted here, which complicate the relationship between the base level cycle and systems-tract architecture and development, it is quite possible for episodic changes in systems-tract development at continental margins to have nothing to do with sea-level change at all. To cite two examples, in the case of the modern Amazon fan, the marked facies variations mapped by the ODP bear no relation to Neogene sea-level changes, but reﬂect autogenic avulsion processes on the upper fan. In the North Sea basin, peaks in submarine fan sedimentation occurred at times of regional uplift of the crust underlying the British Isles, as a consequence of episodes of magma under plating, resulting in increased sediment delivery to the marine realm. There is a possible confusion between the terminology of systems tracts (highstand, falling stage, etc.) and the actual state of the sea-level cycle which they represent. Heavy oil seeping out on the surface has been known for a long time and this was easy to exploit for use in small quantities. Even after drilling for oil became successful (in 1857 in Pennsylvania), mining for heavy oil continued in many parts of the world including Germany. In southern California (Ventura and Los Angeles basins) oil was mined from the early 1860s to the 1890s because the heavy oil would not ﬂow to the wells. Tar sands are sandstone reservoirs which have been ﬁlled with oil at shallow depth <2 km (<70–80◦C) so that the oil has become biodegraded. Reservoir rocks which have been buried more deeply and then uplifted before the oil migration may be sterilised at higher temperatures and are less likely to be biodegraded. When the sandstone has not been buried to more than about 2 km depth the sand will remain mostly uncemented as loose sand because of a lack of quartz cement. Tar sand contains asphaltic oil rich in asphaltenes and resins. It has a high content of aromatics and naphthenes compared to parafﬁns, and a high content of nitrogen, sulphur and oxygen (NSO). Most of the hydrocarbon molecules have more that 60 carbon atoms and the boiling point and viscosity are therefore very high. 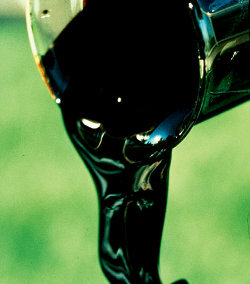 The viscosity of the biodegraded oil is very low and the oil must be heated so that the viscosity is reduced before it can be produced by drilling wells. There are transitions between reservoirs with heavy oil and nearly solid bitumen. Heating can be achieved by soaking the reservoir with injected steam so that the heat of condensation to water helps to heat the oil. This is called cyclic steam injection when the steam is injected in the production well and left to soak for a few weeks before production starts when the oil is warmer. The steam may also be injected in a nearby well and driven towards the production well. Much of the energy is used to heat the water in the reservoir and it is important to reduce the inﬂow of water from adjacent rocks. One method includes freezing the ground at a distance from the well to avoid the ﬂow of water towards the well. It is also possible to burn some of the oil in the subsurface to provide heat to heat the oil. It has also been proposed to heat the oil electrically, possibly powered by a nuclear reactor to reduce the CO2 emissions from burning oil to produce heat. The tar sands in Alberta, Canada (Athabasca) are of Middle Cretaceous age (Aptian, 100 million years). The main reservoir rock is the McMurray Formation, a sandstone representing ﬂuvial to tidal environments, and it is important to ﬁnd thick sequences of sand with few clay layers. The oil was generated from older source rocks during the Laramide folding of the Rocky Mountains to the west and migrated into the Athabasca sands during the late Cretaceous and early Tertiary. Starting in the Eocene (50 million years) the sand was uplifted and most of the overburden eroded. The oil was then biodegraded by bacteria. These tar sands contain 1.7 trillion bbl (270 × 109 m3) of bitumen in-place, comparable in magnitude to the world’s total proven reserves of conventional petroleum. There are currently large mining operations at Athabasca. At surface temperatures, which are low in northern Canada, this tar sand is rather hard because of the high viscosity of the oil. The oil must be separated from the sand using hot water. The oil (tar) is very viscous and may be denser than water (API <10). Only about 20% is close enough to the surface to be economically mined and the rest must be heated in place. A cubic metre of oil, mined from the tar sands, needs 2–4.5 m3 of water. Oil may be extracted by steam-assisted gravity drainage (SAGD). Two parallel horizontal wells are drilled so that one is about 5 m below the other. Steam is injected in the shallowest well and the heated, less viscous, oil is drained into the lower well where it is produced. The steam will remain near the top due to its low density but will sink when condensed to water. The shales will reduce the vertical permeability and the drainage, but the heating will cause some fracturing which may allow more vertical ﬂow. This method requires rather thick and homogeneous sand. Steam can also be injected into one well for a few weeks until the oil is heated and then produced from the same well. This is called cyclic steam stimulation (CSS). Large amounts of energy and water are required to produce the steam for this method. If petroleum is burned to produce the heat, high emissions of CO2 will result not only from when the oil is burnt as fuel but also from producing it. The steam may be mixed with solvents (gas) and this may reduce the amount of heat (steam) required. Much of the water used to produce steam can be recovered and used again. For each 3 bbl of oil produced one barrel is burned to produce the steam required for the production. This heavy oil should also be mixed with gas during the reﬁning and a supply of gas is therefore important. Heating the oil with electricity has also been proposed and hydroelectric or nuclear power would reduce the CO2 emissions. 173 billion bbl (27.5×109 m3) of crude bitumen, which is 10% of the total bitumen in place, are economically recoverable using current technology from the three Alberta oil sand areas based on benchmark WTI market prices of $62/bbl in 2006, rising to a projected $69/bbl in 2016. The environmental problems associated with oil production from tar sand are considerable and very large amounts of water are required both for the production of steam for subsurface operations and for the processing of loose sand excavated from surface pits. As a result the release of CO2 is higher than with normal petroleum production if the CO2 is not captured and sequestrated. In Venezuela there are also very large reserves of heavy oil and tar sand such as the Orinoco tar sand. While the average surface temperature in Northern Alberta is only slightly above 0◦C the surface temperature in Venezuela is much higher (>20◦C) and the oil therefore needs less heating to reduce its viscosity. Much of the oil in Venezuela is heavy oil and it occurs in a foreland basin in front of the Cordilleran Mountains in a similar plate tectonic position to the heavy oil in Alberta. Also the oil in the Middle East is located in a similar foreland basin but here the reservoir shave not been uplifted so close to the surface and are therefore in most cases not so biodegraded. It is possible to make an emulsion between bitumen and water which has low viscosity and which can ﬂow in pipelines and be burned directly to produce electric power. The heavy oil and bitumen is rather rich in sulphur which should be removed to avoid pollution. It can also be mixed with gas so that it can be used to produce normal oil products. 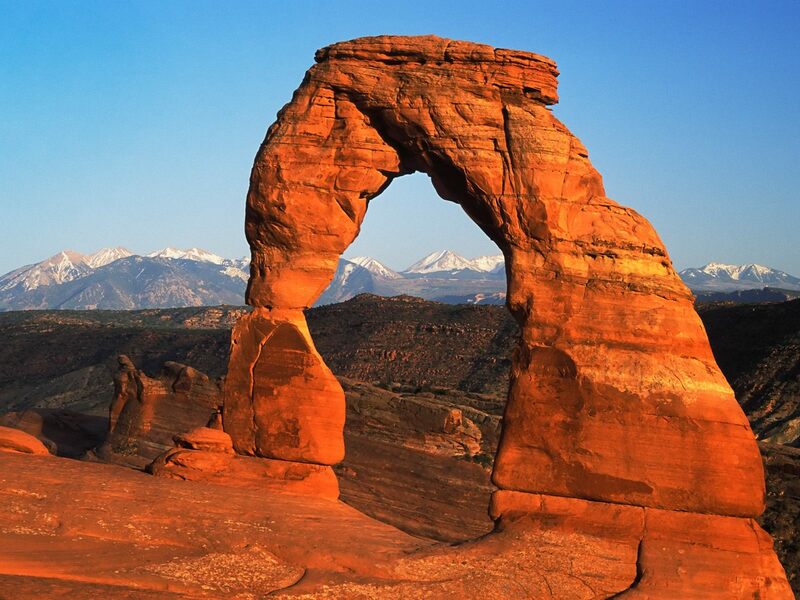 There are other important tar sand deposits in the USA (Utah) and Africa (Congo and Madagascar). Tar sand has only recently been included in data on world oil reserves and as a result Canada has become one of the nations with the highest oil reserves. 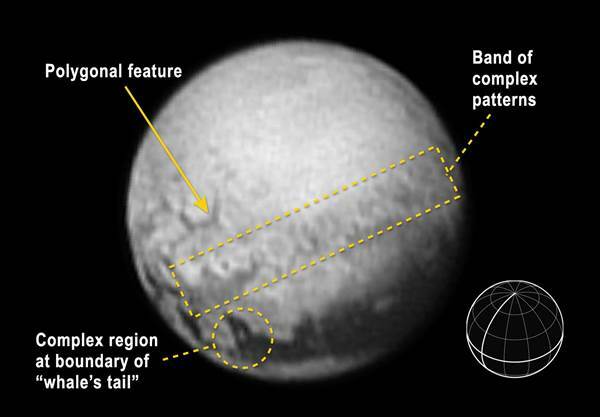 As NASA’s New Horizons spacecraft barrels toward Pluto, rapidly approaching its close encounter on July 14, long-distance reconnaissance by the probe is revealing a fascinating surface geology. Far from being a bland, uniform surface, the dwarf planet seems to play host to a complex array of geological features that planetary scientists are already trying to decipher. The New Horizons probe, hurtling ever closer to Pluto, is beginning to pick up clear signs of surface geology, including unusual polygon-shaped features and sharp transitions between bright areas and a dark region along the equator known as "the whale," project scientists said Friday. 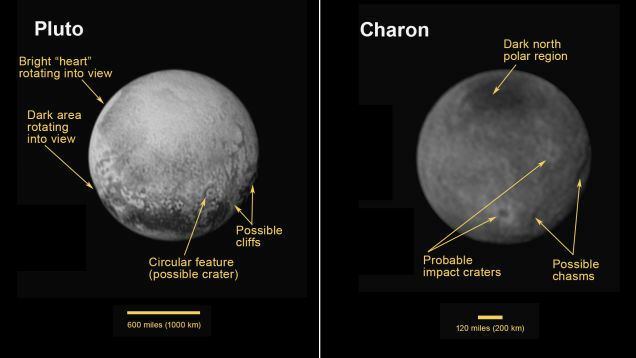 The latest image was snapped Thursday while New Horizons was still 3.3 million miles from its target. As such, features are not yet in razor-sharp focus. 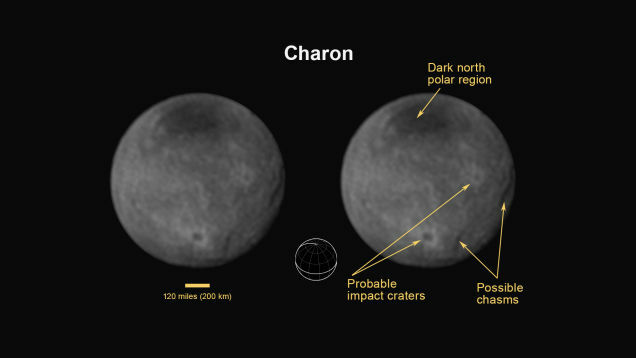 But the clarity is steadily improving as New Horizons races toward Pluto at more than 31,000 mph. The "tail" of the dark equatorial region nicknamed the "whale" has what appears to be a large, lighter-coloured peninsula and tiny speck of light material, suggesting some kind of complex geology or broken landscape. A "polygonal feature" somewhat north of the equator could be crevasses with shapes governed by shearing minerals or some other, less obvious phenomenon. 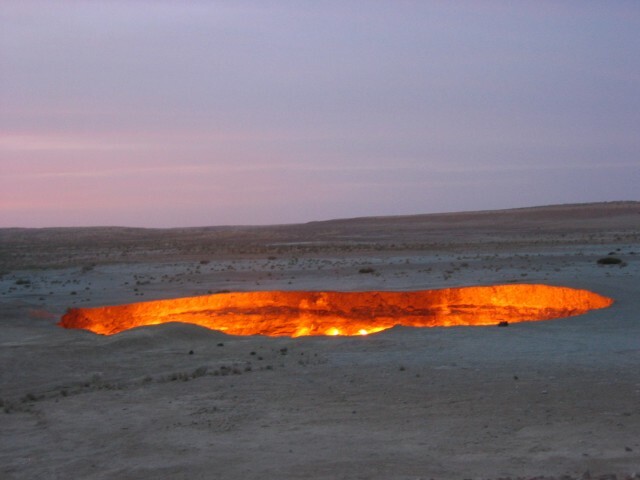 The door to heel is a field of natural gas in Darweza, Turkmenistan which was discovered in 1971. 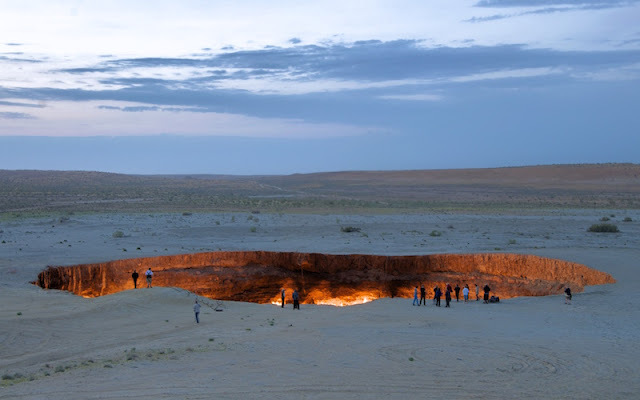 It is in the middle of the Karakum Desert, about 260 kilometres (160 mi) north ofAshgabat. The gas reserve found here is one of the largest in the world. 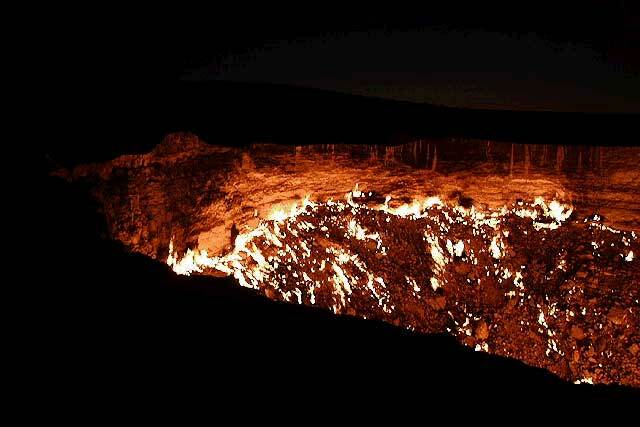 The name "Door to Hell" was given to the field by the locals, referring to the fire, boiling mud, and orange flames in the large crater, which has a diameter of 70 metres (230 ft). The hot spots range over an area with a width of 60 metres (200 ft) and to a depth of about 20 metres (66 ft). Expecting dangerous releases of poisonous gases from the cavern into the nearby towns, the engineers saw it as best to burn the gas off. The gas was estimated to burn out within a few weeks, but it has instead continued to burn for more than four decades after it was set on fire. 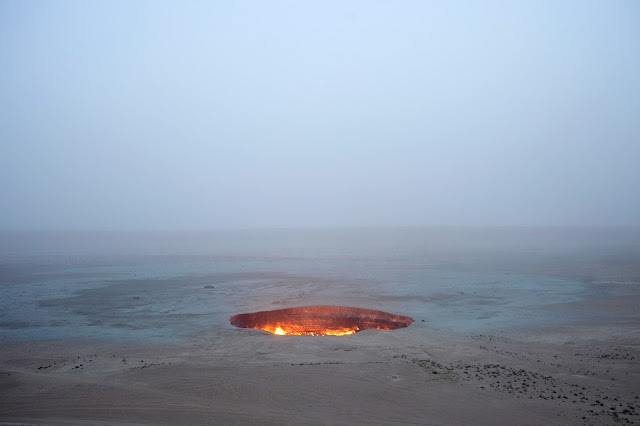 In April 2010 the country's president, Gurbanguly Berdimuhamedow, visited the site and ordered that the hole should be closed but this is yet to happen. The Karakum Desert, which covers much of Turkmenistan, lies east of the Caspian Sea. The Aral Sea is located to the north and the Amu Darya river and the Kyzyl Kum Desert lie to the north-east. The area has significant oil and natural gas deposits. Turkmenistan plans to increase its production of natural gas, intending to increase its export of gas to many countries for example Pakistan, China, India, Iran, Russia, and Western Europe from its present level to 75 million cubic metres (2.6×109 cubic ft) in the next 20 years. 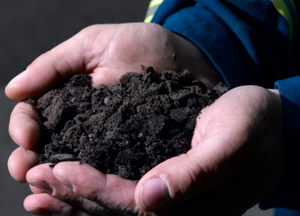 The development of a soil from inorganic and organic materials is a complex process. Intimate interactions of the rock and hydrologic cycles produce the weathered rock materials that are basic ingredients of soils. Weathering is the physical and chemical breakdown of rocks and the first step in soil development. Weathered rock is further modified by the activity of soil organisms into soil, which is called either residual soil or transported soil, depending on where and when it has been modified. The more insoluble weathered material may remain essentially in place and be modified to form a residual soil, such as the red soils of the Piedmont in the south-eastern United States. If weathered material is transported by water, wind, or glaciers and then modified in its new location, it forms a transported soil, such as the fertile soils formed from glacial deposits in the American Midwest. A soil can be considered an open system that interacts with other components of the geologic cycle. The characteristics of a particular soil are a function of climate, topography, parent material(the rock or alluvium from which the soil is formed), time (age of the soil), and organic processes(activity of soil organisms). Many of the differences we see in soils are effects of climate and topography, but the type of parent rock, the organic processes, and the length of time the soil forming processes have operated are also important. Vertical and horizontal movements of the materials in a soil system create a distinct layering, parallel to the surface, collectively called a soil profile. 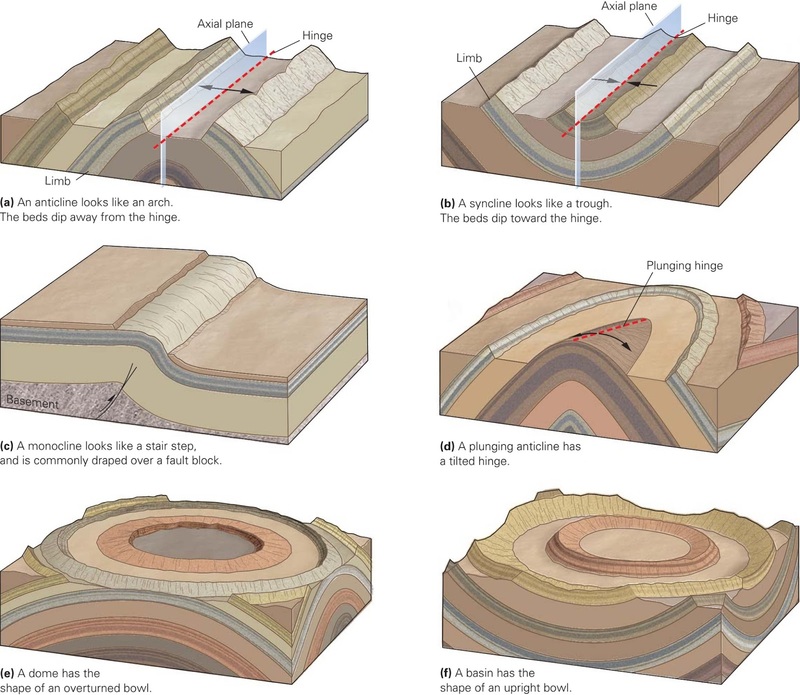 The layers are called zones or soil horizons. Our discussion of soil profiles will mention only the horizons most commonly present in soils. The O horizon and A horizon contain highly concentrated organic material; the differences between these two layers reflect the amount of organic material present in each. Generally, the O horizon consists entirely of plant litter and other organic material, while the underlying A horizon contains a good deal of both organic and mineral material. Below the O or A horizon, some soils have an E horizon, or zone of leaching, a light-coloured layer that is leached of iron-bearing components. This horizon is light in colour because it contains less organic material than the O and A horizons and little inorganic colouring material such as iron oxides. The B horizon, or zone of accumulation, underlies the O, A, or E horizon and consists of a variety of materials trans-located downward from overlying horizons. Several types of B horizon have been recognized. Probably the most important type is the argillic B, or horizon. A horizon is enriched in clay minerals that have been trans-located downward by soil-forming processes. Another type of B horizon of interest to environmental geologists is the horizon, characterized by the accumulation of calcium carbonate. 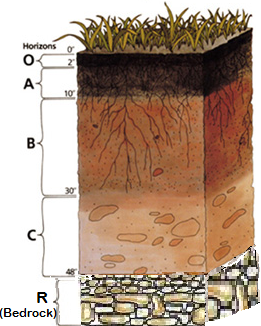 The carbonate coats individual soil particles in the soils and may fill some pore spaces (the spaces between soil particles), but it does not dominate the morphology (structure) of the horizon. 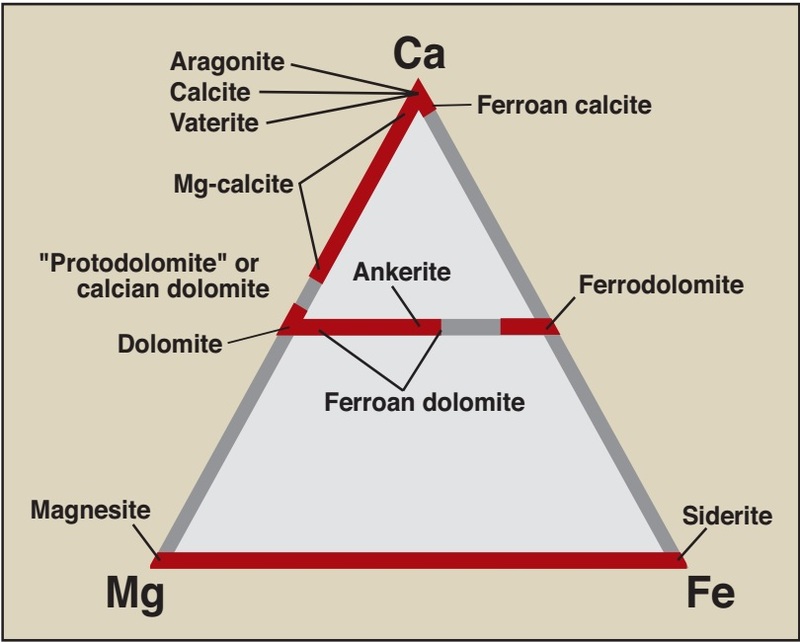 A soil horizon that is so impregnated with calcium carbonate that its morphology is dominated by the carbonate is designated a K horizon. Carbonate completely fills the pore spaces in K horizons, and the carbonate often forms in layers parallel to the surface. The term caliche is often used for irregular accumulation or layers of calcium carbonate in soils. The C horizon lies directly over the unaltered parent material and consists of parent material partially altered by weathering processes. The R horizon, or unaltered parent material, is the consolidated bedrock that underlies the soil. However, some of the fractures and other pore spaces in the bedrock may contain clay that has been trans-located downward. The term hardpan is often used in the literature on soils. A hardpan soil horizon is defined as a hard (compacted) soil horizon. Hardpan is often composed of compacted and/or cemented clay with calcium carbonate, iron oxide, or silica. Hardpan horizons are nearly impermeable and, thus, restrict the downward movement of soil water. One of the first things we notice about a soil is its colour, or the colours of its horizons. The O and A horizons tend to be dark because of their abundant organic material. The E horizon, if present, may be almost white, owing to the leaching of iron and aluminium oxides. 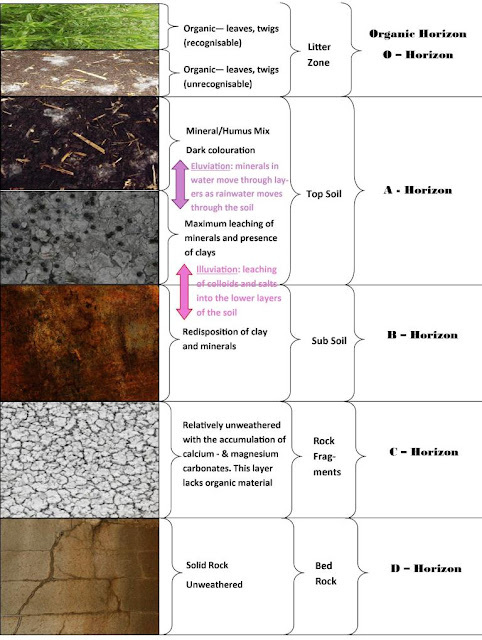 The B horizon shows the most dramatic differences in colour, varying from yellow-brown to light red-brown to dark red, depending upon the presence of clay minerals and iron oxides. The horizons may be light coloured due to their carbonates, but they are sometimes reddish as a result of iron oxide accumulation. If a true K horizon has developed, it may be almost white because of its great abundance of calcium carbonate. Although soil colour can be an important diagnostic tool for analysing a soil profile, one must be cautious about calling a red layer a B horizon. The original parent material, if rich in iron, may produce a very red soil even when there has been relatively little soil profile development. Soil colour may be an important indicator of how well drained a soil is. 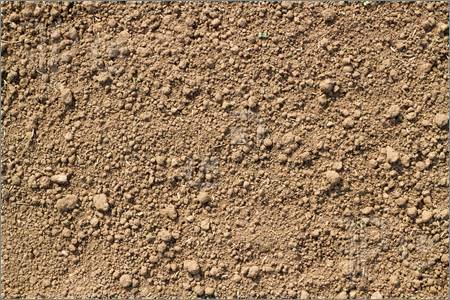 Well-drained soils are well aerated (oxidizing conditions), and iron oxidises to a red colour. Poorly drained soils are wet, and iron is reduced rather than oxidised. The colour of such a soil is often yellow. This distinction is important because poorly drained soils are associated with environmental problems such as lower slope stability and inability to be utilised as a disposal medium for household sewage systems (septic tank and leach field). The texture of a soil depends upon the relative proportions of sand-, silt-, and clay-sized particles. Clay particles have a diameter of less than 0.004 mm, silt particles have diameters ranging from 0.004 to 0.074 mm, and sand particles are 0.074 to 2.0 mm in diameter. Earth materials with particles larger than 2.0 mm in diameter are called gravel, cobbles, or boulders, depending on the particle size. Note that the sizes of particles given here are for engineering classification and are slightly different from those used by the U.S. Department of Agriculture for soil classification. Soil texture is commonly identified in the field by estimation, then refined in the laboratory by separating the sand, silt, and clay and determining their proportions. A useful field technique for estimating the size of sand-sized or smaller soil particles is as follows: It is sand if you can see individual grains; silt if you can see the grains with a 10¥ hand lens; and clay if you cannot see grains with such a hand lens. Another method is to feel the soil: Sand is gritty (crunches between the teeth), silt feels like baking flour, and clay is cohesive. When mixed with water, smeared on the back of the hand, and allowed to dry, clay cannot be dusted off easily, whereas silt or sand can. 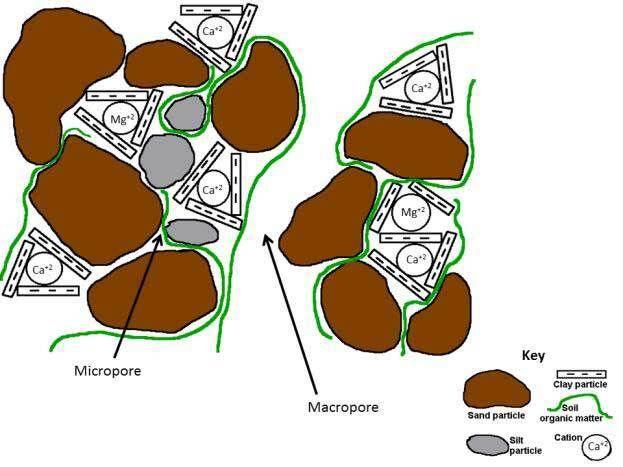 Soil particles often cling together in aggregates, called peds, that are classified according to shape into several types. The type of structure present is related to soil-forming processes, but some of these processes are poorly understood. For example, granular structure is fairly common in A horizons, whereas blocky and prismatic structures are most likely to be found in B horizons. Soil structure is an important diagnostic tool in helping to evaluate the development and approximate age of soil profiles. In general, as the profile develops with time, structure becomes more complex and may go from granular to blocky to prismatic as the clay content in the B horizons increases. A weakly developed soil profile is generally characterised by an A horizon directly over a C horizon (there is no B horizon or it is very weakly developed). The C horizon may be oxidized. Such soils tend to be only a few hundred years old in most areas, but may be several thousand years old. A moderately developed soil profile may consist of an A horizon overlying an argillic horizon that overlies the C horizon. A carbonate horizon may also be present but is not necessary for a soil to be considered moderately developed. These soils have a B horizon with trans-located changes, a better-developed texture, and redder colours than those that are weakly developed. Moderately developed soils often date from at least the Pleistocene (more than 10,000 years old). A well-developed soil profile is characterized by redder colours in the horizon, more trans-location of clay to the horizon, and stronger structure. A K horizon may also be present but is not necessary for a soil to be considered strongly developed. Well-developed soils vary widely in age, with typical ranges between 40,000 and several hundred thousand years and older. A soil chronosequence is a series of soils arranged from youngest to oldest on the basis of their relative profile development. Such a sequence is valuable in hazards work, because it provides information about the recent history of a landscape, allowing us to evaluate site stability when locating such critical facilities as a waste disposal operation or a large power plant. A chronosequence combined with numerical dating (applying a variety of dating techniques, such as radiocarbon 14C, to obtain a date in years before the present time of the soil) may provide the data necessary to make such inferential statements as, There is no evidence of ground rupture due to earthquakes in the last 1000 years, or The last mud flow was at least 30,000 years ago. It takes a lot of work to establish a chronosequence in soils in a particular area. However, once such a chronosequence is developed and dated, it may be applied to a specific problem. Consider, for example, an offset alluvial fan along the San Andreas fault in the Indio Hills of southern California. The fan is offset about 0.6 km (60,000 cm). Soil pits excavated in the alluvial fan suggest that it is at least 20,000 years old, but younger than 45,000 years. The age was estimated on the basis of correlation with a soil chronosequence in the nearby Mojave Desert, where numerical dates for similar soils are available. Soil development on the offset alluvial fan allowed the age of the fan to be estimated. This allowed the slip rate (the amount of offset of the fan divided by the age of the fan that is, for this part of the San Andreas fault to be estimated at about 3 cm annually. More recent work, using a numerical dating technique known as exposure dating, suggests the age of years and a total displacement of about 570 m. This new and more accurate estimation of age provides a maximum slip rate of about 1.7 cm/yr. Thus, the earlier soil date has been improved by more recent technology. As numerical dating has improved, the use of soil development as a dating tool has decreased. 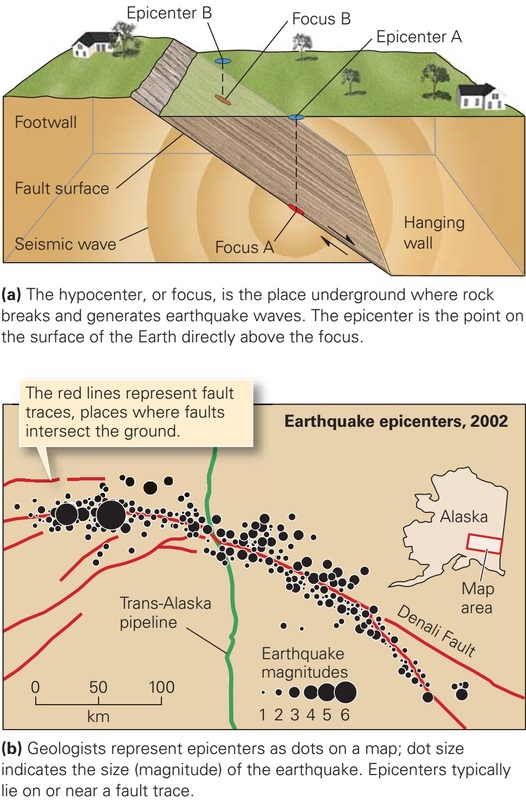 The slip rate for this segment of the fault was not previously known. The rate is significant because it is a necessary ingredient in the eventual estimation of the probability and the recurrence interval of large, damaging earthquakes. 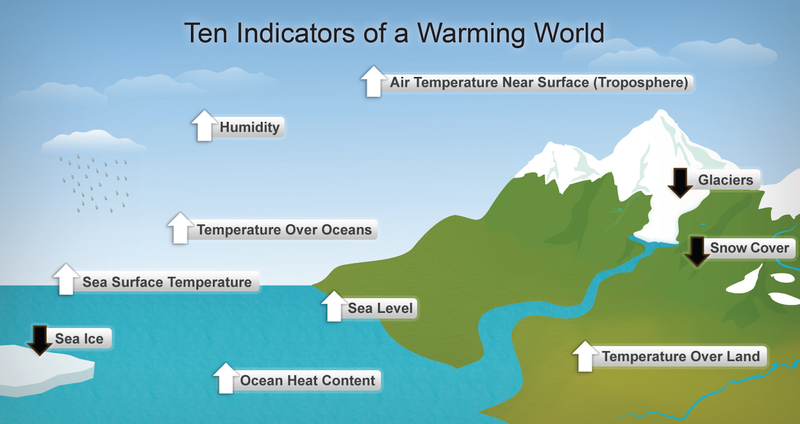 Global warming is defined as climate change that causes an increase in the temperature of Earth's lower atmosphere. Anthropogenic global warming is the observed increase (from recorded measurements using modern instruments) in the average temperature of the near-surface atmosphere, land, and ocean environments of Earth during the past 50 years as a result of human activities. A growing volume of evidence suggests that we are now in a period of global warming resulting from burning vast amounts of fossil fuels. Does this mean we are experiencing human-induced global warming? 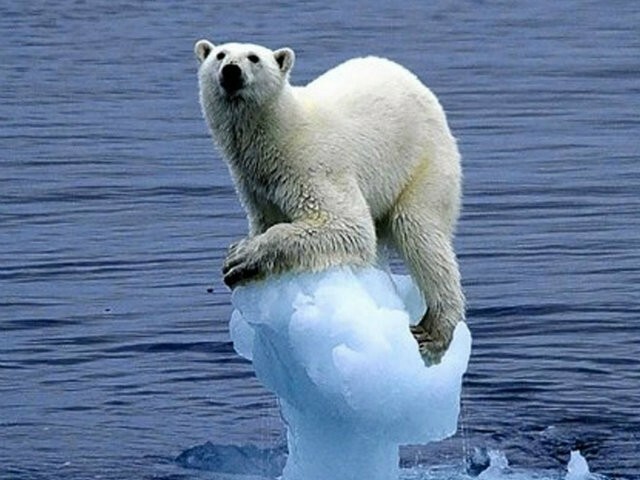 Many scientists now believe that human processes, as well as natural ones, are contributing significantly to global warming. For the most part, the temperature of Earth is determined by three factors: the amount of sunlight Earth receives, the amount of sunlight Earth reflects (and, therefore, does not absorb), and atmospheric retention of re-radiated heat. Earth's energy balance today is slightly out of equilibrium, with about 1 W/m2 more energy coming from the Sun that is lost to space. The energy we are talking about, W/m2, is energy per unit time (joules/sec) per unit area (m2). The units W/m2 is power per unit area, but we speak of it as solar energy. The units W/m2 are widely used in global warming and climate change research. Earth receives energy from the Sun in the form of electromagnetic radiation. Radiation from the Sun is relatively short wave and mostly visible, whereas Earth radiates relatively long-wave infra-red radiation. The hotter an object, whether it is the Sun, Earth, a rock, or a lake, the more electromagnetic energy it emits. The Sun, with a surface temperature of 5800°C (10,472°F), radiates much more energy per unit area than does Earth, which has an average surface temperature of 15°C (59°F). Absorbed solar energy warms Earths atmosphere and surface, which then re-radiate the energy back into space as infra-red radiation . Water vapour and several other atmospheric gases including carbon dioxide methane and chlorofluorocarbons (CFCs), human-made chemicals used in air conditioners and refrigerators tend to trap heat. That is, they absorb some of the energy radiating CH4, CO2, from Earth's surface and are thereby warmed. As a result, the lower atmosphere of Earth is much warmer than it would be if all of its radiation escaped into space without this intermediate absorption and warming. 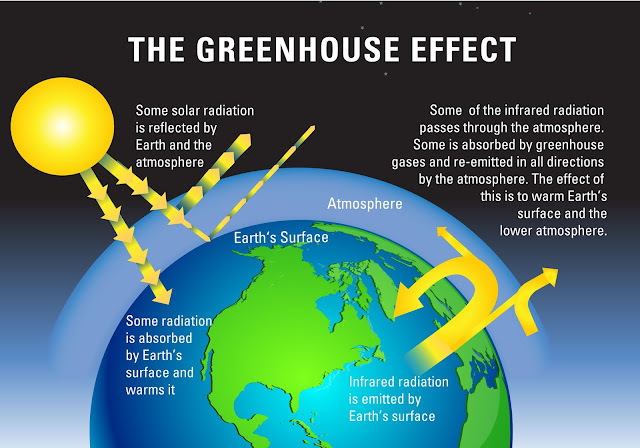 This effect is somewhat analogous to the trapping of heat by a greenhouse and is therefore referred to as the greenhouse effect. It is important to understand that the greenhouse effect is a natural phenomenon that has been occurring for millions of years on Earth, as well as on other planets in our solar system. Without heat trapped in the atmosphere, Earth would be much colder than it is now, and all surface water would be frozen. Most of the natural greenhouse warming is due to water vapour and small particles of water in the atmosphere. However, potential global warming due to human activity is related to carbon dioxide, methane, nitrogen oxides, and chlorofluorocarbons. In recent years, the atmospheric concentrations of these gases and others have been increasing because of human activities. These gases tend to absorb infrared radiation from Earth, and it has been hypothesized that Earth is warming because of the increases in the amounts of these so-called greenhouse gases. Table 16.1 shows the rate of increase of these atmospheric gases due to human-induced emissions and their relative contribution to the anthropogenic, or human caused, component of the greenhouse effect. Notice that carbon dioxide produces 60 percent of the relative contribution. Measurements of carbon dioxide trapped in air bubbles of the Antarctic ice sheet suggest that, during most of the past 160,000 years, the atmospheric concentration of carbon dioxide has varied from a little less than 200 ppm to about 300 ppm.5 The highest levels are recorded during major interglacial periods that occurred approximately 125,000 years ago and at the present. Major interglacials occurred about four times during the past 400,000 years about every 100,000 years. During each of these, the concentration of CO2 in the atmosphere was similar to that of the most recent interglacial event about 125,000 years ago.7 At the beginning of the Industrial Revolution, the atmospheric concentration of carbon dioxide was approximately 280 ppm. Since 1860, fossil fuel burning has contributed to the exponential growth of the concentration of carbon dioxide in the atmosphere. Data for before the mid-twentieth century are from measurements made from air bubbles trapped in glacial ice. The concentration of carbon dioxide in the atmosphere today exceeds 380 ppm, and it is predicted to reach at least 450 ppm more than 1.5 times the pre-industrial level by the year 2050. Changes in atmospheric concentration of carbon dioxide at Mauna Loa. The annual cycles with a lower concentration of during the summer are due to the summer growing season in the Northern Hemisphere, when plants extract more carbon dioxide from the atmosphere by photosynthesis. The Pleistocene ice ages began approximately 2 million years ago, and, since then, there have been numerous changes in Earth's mean annual temperature. Figure 16.13 shows the changes of approximately the past million years on several time scales. The first scale shows the entire million years, during which there have been major climatic changes involving swings of several degrees Celsius in mean temperature. Low temperatures have coincided with major glacial events that have greatly altered the landscape; high temperatures are associated with interglacial conditions. Interglacial and glacial events become increasingly prominent in the scales, showing changes over 150,000 and 18,000 years. The last major interglacial warm period, even warmer than today, was the Eemian. During the Eemian, the sea level was a few meters higher than it is today. The cold period that occurred about 11,500 years ago is known as the Younger Dryas, followed by rapid warming to the Holocene maximum, which preceded the Little Ice Age. A scale of 1000 years shows several warming and cooling trends that have affected people. For example, a major warming trend from approximately A.D. 1100 1300 allowed the Vikings to colonize Iceland, Greenland, and northern North America. When glaciers made a minor advance around A.D. 1400, during a cold period known as the Little Ice Age, the Viking settlements in North America and parts of Greenland were abandoned. In approximately 1750, an apparent warming trend began that lasted until approximately the 1940s, when temperatures cooled slightly. Over the last 140 years, more changes are apparent, and the 1940s event is clearer. It is evident from the record that, in the last 100 years, global mean annual temperature increased by approximately 0.8°C (1.4°F). Most of the increase has been since the 1970s, and the 1990s and first 8 years of the twenty-first century had the warmest temperatures since global temperatures have been monitored. 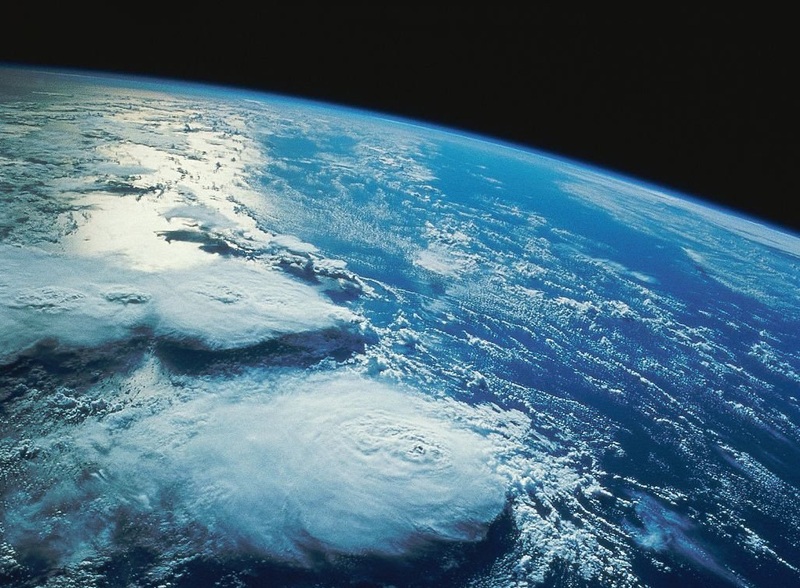 This period may become known as the early twenty-first century increase in global temperature. 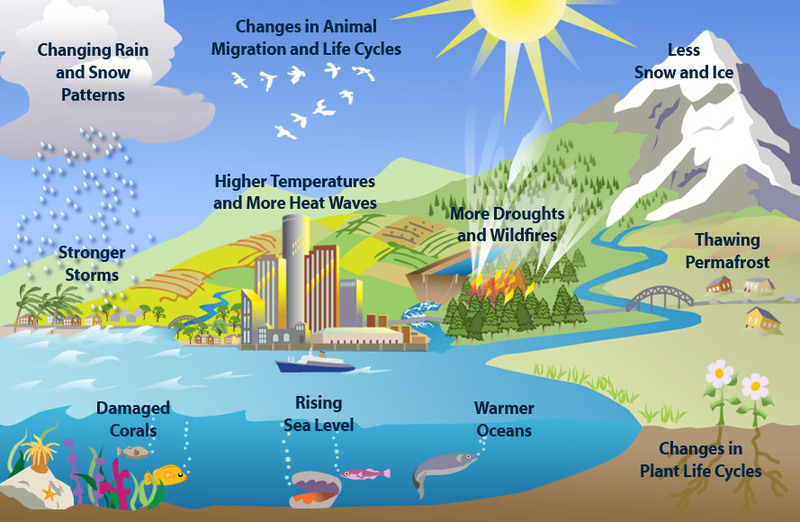 The question that begs to be answered is: Why does climate change?. There are cycles of change lasting 100,000 years, separated by shorter cycles of 20,000 to 40,000 years in duration. These cycles were first identified by Milutin Milankovitch in the 1920s as a hypothesis to explain climate change. Milankovitch realized that the spinning Earth is like a wobbling top, unable to keep a constant position in relationship to the Sun; this instability partially determines the amount of sunlight reaching and warming Earth. He discovered that variability in Earths orbit around the Sun follows a 100,000-year cycle that is correlated with the major glacial and interglacial periods. Earths orbit varies from a nearly circular ellipse to a more elongated ellipse. Over the 100,000-year cycle of Earth, when the orbit is most elliptical, solar radiation reaching Earth is greater than during a more circular orbit. Cycles of approximately 40,000 and 20,000 years are the result of changes in the tilt and wobble of Earth's axis, respectively. Milankovitch cycles reproduce most of the long-term cycles observed in the climate, and they do have a significant effect on climate. However, the cycles are not sufficient to produce the observed largescale global climatic changes. Therefore, these cycles, along with other processes, must be invoked to explain global climatic change. Thus, the Milankovitch cycles that force (push) the climate in one direction or another can be looked at as natural processes (forcing) that, when linked to other processes (forcing), produce climatic change. We now will consider this forcing concept in more detail. Climate forcing is defined as an imposed change of Earth's energy balance. The units for the forcing are W/m2 and can be positive if a particular forcing increases global mean temperature or negative if temperature is decreased. For example, if the energy from the Sun increases, then Earth will warm (this is positive climate forcing). If CO2 were to decrease, causing Earth to cool, that is an example of negative climate forcing. Climate sensitivity refers to the response of climate to a specific climate forcing after a new equilibrium has been established, and the time required for the response to a forcing to occur is the climate response time. A significant implication of climate forcing is that, if you maintain small climate forcing for a long enough time, then large climate change can occur.The climate forcing that produced the last ice age 22,000 years ago (last glacial maximum). Notice that 1 W/m2 produces a temperature change of about 0.75°C. Total positive forcing is about 1.6 W/m2, most of which is due to greenhouse gas forcings (CO2, CH4, N2O). They have increased dramatically in the past 100 years. We now believe that our climate system may be inherently unstable and capable of changing quickly from one state to another in as short a time as a few decades. However, very short or abrupt climate change is unlikely. Part of what may drive the climate system and its potential to change is the ocean conveyor belt, a global-scale circulation of ocean waters, characterized by strong northward movement of 12° to 13°C (53° to 55°F) near-surface waters in the Atlantic Ocean that are cooled to 2° to 4°C (35° to 39°F) when they arrive near Greenland. As the water cools, it becomes saltier; the salinity increases the waters density and causes it to sink to the bottom. The current then flows southward around Africa, adjoining the global pattern of ocean currents. The flow in this conveyor belt current is huge, equal to about 100 Amazon Rivers. The amount of warm water and heat released to the atmosphere, along with the stronger effect of relatively warm winter air moving east and northeast across the Atlantic Ocean, is sufficient to keep northern Europe 5° to 10°C (8.5° to 17°F) warmer than it would be otherwise. If the conveyor belt were to shut down, it would have an effect on the climate of Europe. However, the effect would not be catastrophic to England and France in terms of producing extreme cold and icebound conditions. (3) the mean surface temperature of Earth will likely increase by between 1.5° to 4.5°C (2.6° to 7.8°F) during the twenty-first century. The human-induced component of global warming results from increased emissions of gases that tend to trap heat in the atmosphere. There is good reason to argue that increases in carbon dioxide and other greenhouse gases are related to an increase in the mean global temperature of Earth. Over the past few hundred thousand years, there has been a strong correlation between the concentration of atmospheric and global temperature. When has been high, temperature has also been high, and, conversely, low concentrations of CO2 have been correlated with a low global temperature. However, to better understand global warming, we need to consider major forcing variables that influence global warming, including solar emission, volcanic eruption, and anthropogenic input. Since the Sun is responsible for heating Earth, solar variation should be evaluated as a possible cause of climate change. When we examine the history of climate during the past 1000 years, the variability of solar energy plays a role. Examination of the solar record reveals that the Medieval Warm Period (A.D. 1000 1300) corresponds with a time of increased solar radiation, comparable to that which we see today. Evaluation of the record also suggests that minimum solar activity occurred during the fourteenth century, coincident with the beginning of the Little Ice Age. Therefore, it appears that variability of the input of solar energy to Earth can partially explain climatic variability during the past 1000 years. However, the effect is relatively small, only 0.25 percent; that is, the difference between the solar forcing from the Medieval Warm Period to the Little Ice Age is only a fraction of 1 percent. Brightening of the Sun is unlikely to have had a significant effect on global warming since the beginning of the Industrial Revolution. through 1992. However, by 1994, most aerosols from the eruption had fallen out of the atmosphere, and global temperatures returned to previous higher levels. Volcanic forcing from pulses of volcanic eruptions is believed to have significantly contributed to the cooling of the Little Ice Age. Recent warming over last few decades of 0.2°C per decade cannot be explained by natural variability of the climate over recent geologic history. Industrial age forcing of 1.6 W/m2 is mostly due to emissions of carbon dioxide that, with other greenhouse gases, have greatly increased in concentration in the past few decades. Climate models suggest that natural forcings in the past 100 years cannot be responsible for what we know to be a nearly 1°C rise in global land temperature. Until recently, it was thought that human activity caused only local or, at most, regional environmental change. It is now generally recognized that the effects of human activity on Earth are so extensive that we are actually involved in an unplanned planetary experiment. To recognize and perhaps modify the changes we have initiated, we need to understand how the entire Earth works as a system. The discipline, called Earth system science, seeks to further this understanding by learning how the various components of the system the atmosphere, oceans, land, and biosphere are linked on a global scale and interact to affect life on Earth. Sediments deposited on floodplains or in lakes, bogs, glaciers, or the ocean may be compared to the pages of a history book. Organic material that is often deposited with sediment may be dated by a variety of methods to provide a chronology. In addition, the organic material can tell a story concerning the past climate, life-forms in the area, and environmental changes that have taken place. Ocean sediments are sampled by drilling from a ship or on an ice shelf and extracting a core several cm in diameter that may be a few 100s to over 1000 meters long. On land, sediment may be sampled by drilling, trenching, or from a natural exposure. One of the more interesting uses of the geologic record has been the examination of glacial ice. 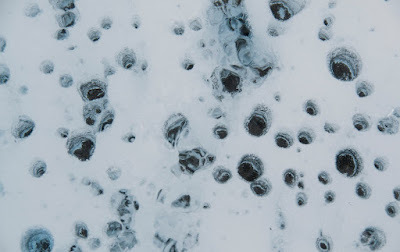 Glacial ice contains trapped air bubbles that may be analyzed to provide information concerning atmospheric carbon dioxide concentrations when the ice formed. These trapped air bubbles are atmospheric time capsules from the past and have been used to analyze the carbon dioxide content of air as old as 800,000 years. The method of studying the glacial record is to drill the ice and extract an ice core, which can be sampled. Glaciers also contain a record of heavy metals, such as lead, that settle out of the atmosphere, as well as a variety of other chemicals that can be used to study recent Earth history. The geologic record is the primary source of data and evidence for understanding Earth's history and changing environment. Without ice cores and layered sediment, we would know little about long-term change and would not be able to put past change learned from the geologic record in the context of what is changing today. Monitoring is the regular collection of data for a specific purpose; real-time monitoring refers to collecting these data while a process is actually occurring. For example, we often monitor the flow of water in rivers to evaluate water resources or flood hazard. In a similar way, samples of atmospheric gases can help establish trends or changes in the composition of the atmosphere; measurements of temperature and the composition of the ocean are also used to examine changes within them. Gathering of real-time data is necessary for testing models and for calibrating the extended prehistoric record derived from geologic data. Methods of monitoring vary with the subject being measured. For example, the impacts from mining may be monitored by evaluating remotely sensed data collected by satellite or high-altitude aerial photographs. However, the most reliable data are often derived from ground measurements that establish the validity of the airborne or satellite measurements. Mathematical models use numerical means to represent real-world phenomena and the linkages and interactions between the processes involved. Mathematical models have been developed to predict the flow of surface water and groundwater, erosion and deposition of sediment in river systems, ocean circulation, and atmospheric circulation. The global change models that have gained the most attention are the climate models. These models predict changes in climate at the global scale. Data used in the calculations are arranged into large cells that represent several degrees of latitude and longitude; typical cells represent an area about the size of Oregon. In addition, there are usually 6 to 20 levels of vertical cells representing the lower atmosphere. Calculations involving equations for major atmospheric processes are then used to make predictions. There is growing confidence that climate models provide believable quantitative estimates of known past and predicted future climate change. 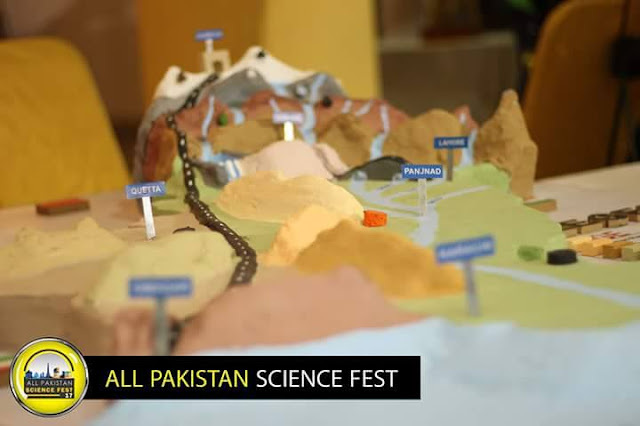 The models are based on physical principles (such as conservation of energy and mass) that are used to produce a mathematical representation of Earth's climate system, defined as the system consisting of the atmosphere, hydrosphere, land surface, biosphere, and cryosphere (ice, snow, and frozen ground) which are linked and often interacting with each other in complex ways. 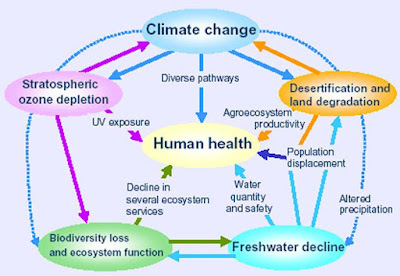 To a great extent, the study of global change is the study of changes in the atmosphere and linkages between the atmosphere, lithosophere, hydrosphere, and biosphere. We define climate as the characteristic atmospheric conditions that is, the weather at a particular place or region over time periods from seasons to years to decades. The climate at a particular location may be complex and consist of more than average precipitation and temperature. For example, it may be dependent on infrequent or extreme seasonal patterns, such as rain in the monsoon season in parts of India. 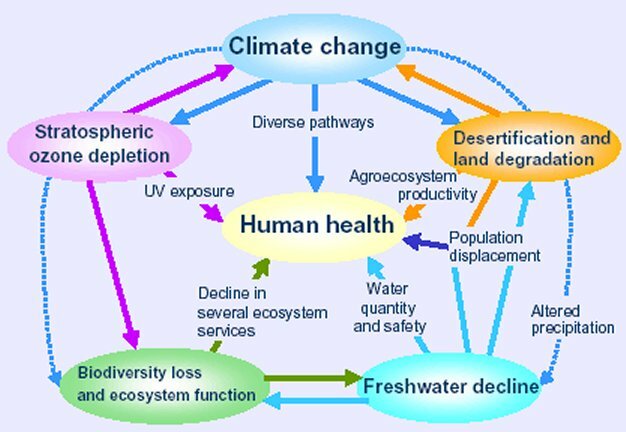 Selected processes and changes that produce and maintain the climate system. Global circulation and movement of air masses in the atmosphere produce the major climatic zones. Warm tropical air near the equator rises and moves north and south, descending in the mid-latitudes (sometimes producing deserts). The air then rises again at higher latitudes and, finally, descends at the poles. The lower, active part of the atmosphere, where weather occurs, is the troposphere. Air temperature and concentration of oxygen decrease with altitude in the troposphere. At the top of the troposphere, at an altitude that varies from about 18 km at the tropics to 7 km at the poles, it is very cold, and the temperature remains nearly constant for a few kilometers through the tropopause. The constant temperature with little air movement places a lid on the active lower atmosphere (troposphere). Temperature then increases in the stratosphere only to decline again in the mesosphere. Nearly all (99 percent) of the atmosphere by weight is below an altitude of about 30 km (20 mi). (78 percent), oxygen (O2) (21 percent), argon (Ar) (0.9 percent), carbon dioxide (CO2) (0.03 percent), and other trace elements (less than 0.07 percent). It also contains compounds, such as methane, ozone, carbon monoxide, oxides of nitrogen and sulfur, hydrogen sulfide, hydrocarbons, and various particulates, many of which are common air pollutants. The most variable part of the atmospheres composition is water vapor (H2O), which can range from approximately 0 percent to 4 percent by volume in the lower atmosphere. Having given this brief introduction to the atmosphere and climate, we will now discuss human-induced global warming in terms of the greenhouse effect the history and process of global temperature change and the potential consequences.